A birthday is like a day at the amusement park. You get to hang out with your friends, enjoy the rides, while feasting on sweet treats all day. The two friends on the Little Girl and Bear printable birthday card are enjoying a ride on the swings. Each one has a big smile on their face while riding in their own personalized basket. 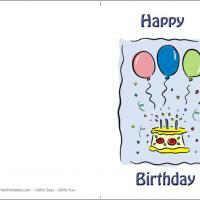 When you pick this free printable birthday card you can enter a name on each basket label. How cool is that to get a birthday card with your own name printed on the front? 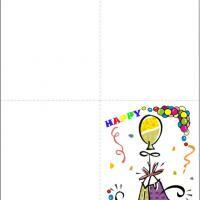 The inside has been left blank so you can add your own best wishes for a jovial birthday! Here we go around again. Whee! 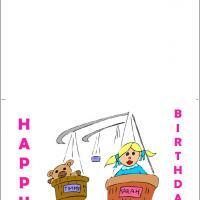 That is what these two friends on the Little Girl and Bear free printable birthday card are thinking as they are floating around in their baskets on a carnival ride. What a fun time just whirling around and around with the wind in their hair that is adding colors of delight to their cheeks. Birthdays are meant to be spent having fun celebrating with your friends. Send this fun card to someone special on your birthday calendar and wish them a whirling good time for their important birthday gala. 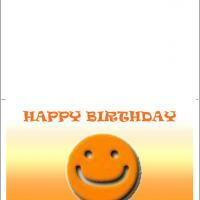 Use the blank inside to custom print a message. Little girls will love to receive this pastel colored birthday card with a girl and a bear enjoying a fun day. These free printable birthday cards are a great way of telling the little girl in your life just how much she makes life seem to look up! It's also easy to imagine your own stories and fun adventures for them to enjoy. 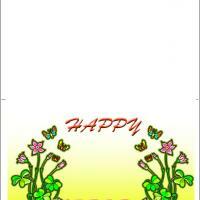 And don't forget to add your own personal message of love and good wishes towards the recipient! Make a warm thoughtful message to go with these free printable cards and girls will want to keep this card forever.